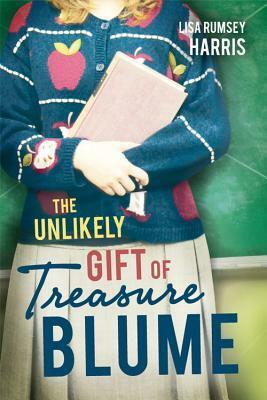 Treasure Blume has gone through her entire life as the girl nobody likes. She wears dowdy sweaters, lives with her cat and her grandmother, teaches first grade, and spends most of her spare time trying to keep her grammy out of trouble and dodge her well meaning family. She doesn’t really have any expectations from life. Men aren’t interested in her and she has very few friends her own age. Despite that she is able to see beauty in everything and is a blessing to the people around her, even people who are unkind. Despite his initial dislike of Treasure, Dennis has to admit that she is a good teacher for his daughter, Micaela. Under her care, Micaela who was quiet and withdrawn has blossomed. Over time Dennis overcomes his dislike of Treasure and starts to see her for the kind-hearted woman she is. The Unlikely Gift of Treasure Blume is a gentle and sweet love story about a woman who doesn’t fit in anywhere, and a man who doesn’t trust easily. It’s a relentlessly optimistic book about resilience and perseverance. Many thanks to Cedar Fort Publishing and Netgalley for providing me with this ARC. This entry was posted in Uncategorized and tagged contemporary romance, family values, lisa rumsey harris, unlikely gift of treasure blume by setaian. Bookmark the permalink.